This is as street food as you can get to! Gobi Fried Rice is what you get when you visit Tirumala and want to have a quick bite before you decide to hit the bed for an early darshanam. I don't think this can be found elsewhere, as this must be something the local innovative chefs seem to have come up to attract the tourists. When we visit Tirumala with our relatives, I get to taste the street food as they don't have such qualms as Daddy would have. Not that I complain either ways. I am always a roman with romans. So now you know. 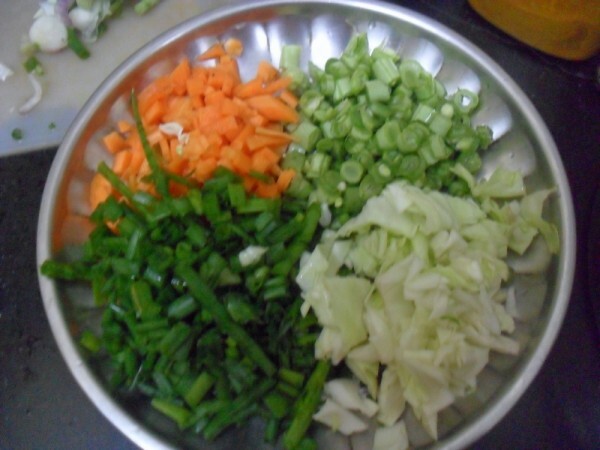 Couple of years back, when we visited with our huge family, we had split thoughts on what to eat for a quick dinner. My FIL and BIL took us to the joint that was serving piping hot meals and the main attraction was the Gobi Fried Rice. It was getting disappeared by the bucket, literally. I even peeped in the backyard where this was getting prepared and yes it was one active kitchen. 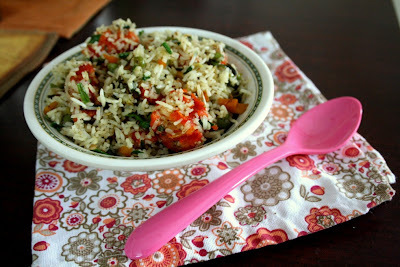 So when everybody wanted to try Gobi Fried Rice, I thought why not! And was it yum! You must eat there to remember the taste for a lifetime. Since then I have always wanted to recreate that at home. Whether my meal today was matching those innovative cooks or not, I really enjoyed making a single pot for myself. I made this for my Sunday lunch and being the lone veg eater, I decided the Main Course demanded I treated myself. 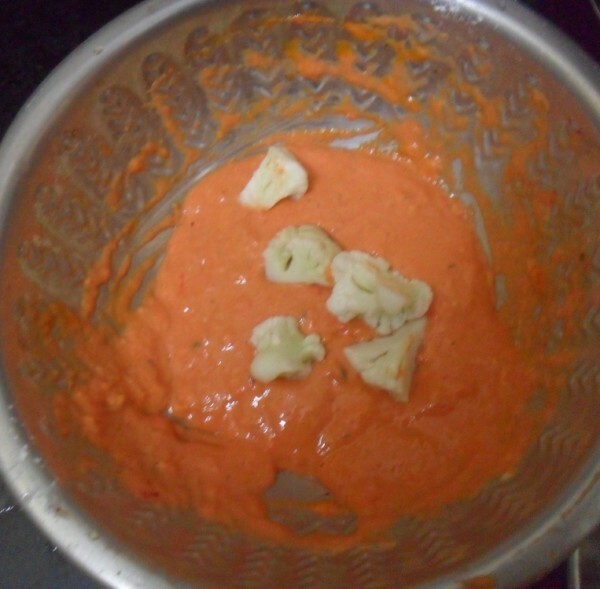 I told Amma that I will be sending across some for her taste, only to know later that she doesn't like cauliflower much. I wonder how one still learn new things about one's kin! 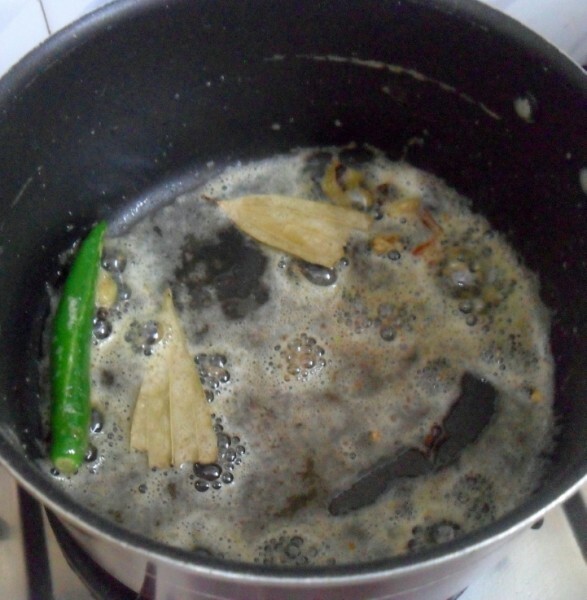 Anyway Athamma said she didn't remember that taste, however this tasted awesome, she is always my touch bearer I tell you! 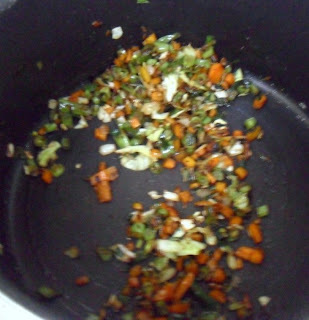 Hubby dear refused to even taste as he can't do mixed dishes. Still he was curious to know if this dish matched that night's feast. That memory remains very fresh in our minds even after so many years. The dish was sheer brilliance both in taste and presentation and of course their indigenous ways to please customers. After having decided that I would be preparing this for the final day under Main course, I thought I would go all the way and make it more street food sorts with food colour etc. I made the Gobi Manchurain as I normally make and the rice in the regular Fried Rice method. Overall the crunchy and fried gobis did lend a good taste to the rice. 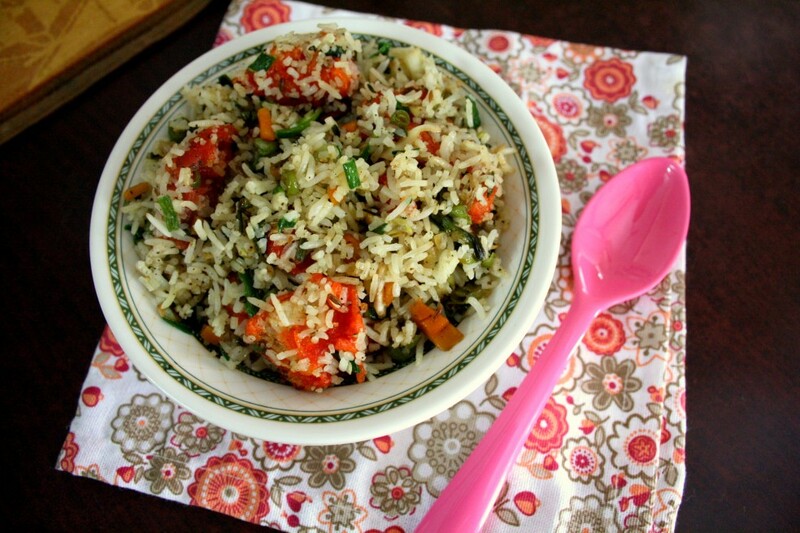 How to make the Gobi Fried Rice. 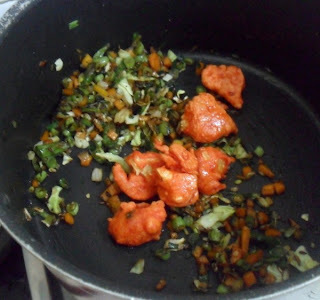 In a non stick pan, heat oil, saute the whole spices and add green chilies and ginger garlic paste. 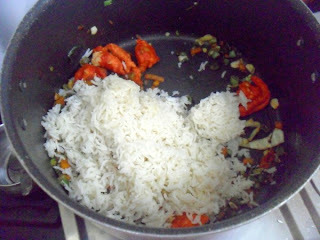 Then add drained rice and saute for couple of mins. 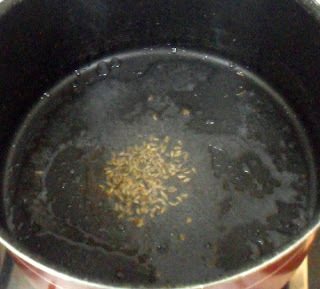 Add 1 & 1/2 cup water for each cup of rice. 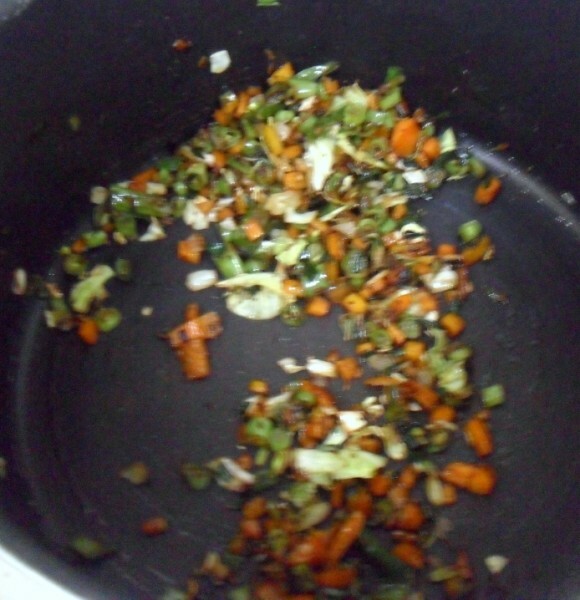 Add salt and bring it to boil. Simmer and cook till done. Keep it aside. 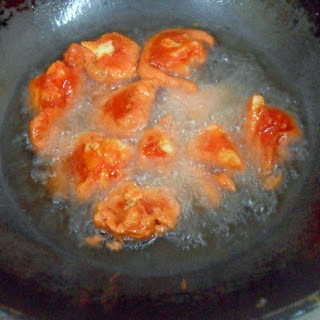 Wash and soak the gobi in salted hot water for 10 mins.Wash again. 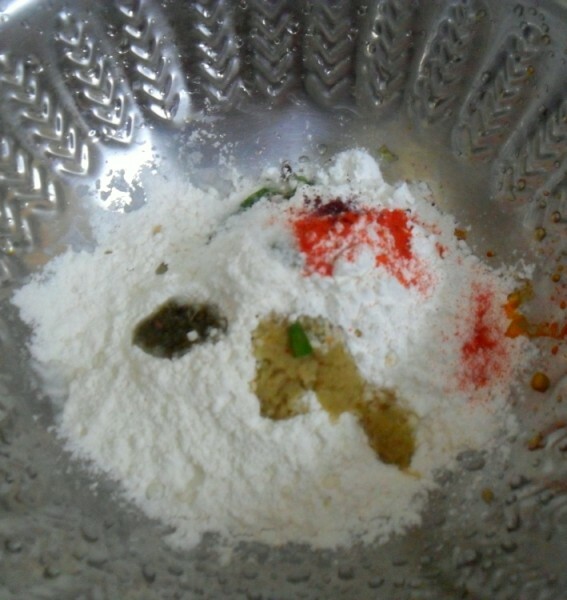 In a bowl, mix in the flours, along with all the other ingredients except oil. Meanwhile, have another non stick pan on heat, add oil sprinkle cumin and let it crackle. 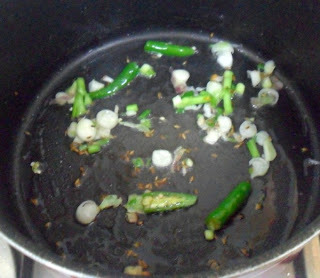 Add the spring onions along with green chilies. Then saute all the vegetables till they are done, yet crunchy. Add the soya sauce, pepper and salt. 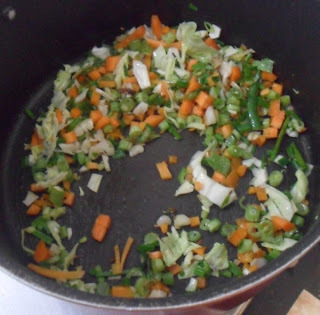 Add the fried gobis and mix everything. 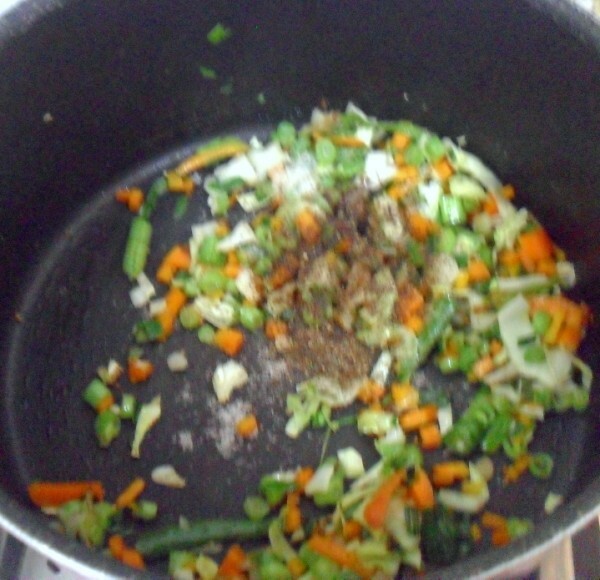 Add the cooked rice and combine everything together. Adjust spice and finally add the spring onion greens. 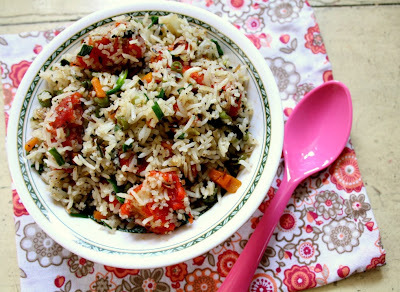 In a typical Fried rice that is part of the Indo Chinese cuisine, cumins are not added. The rice that is made today was just ghee rice that was part of the non vegetarian meal as well. Didn't want to make two different rice dishes. I normally cook rice with just salt. Even though I added green chillies in three different stages, the final dish wasn't so spicy. so you can adjust as per your taste.